you only need a good quality ADSL line. saving as the program can route the calls using carriers with the lowest rate for the particular prefix called by the user (least cost routing). Hardware Configuration : the first step is to configure the devices that compose the system, or rather, the server that executes the Explorer Manager module and SIP telephones. For further information, refer to the Call Shop Configuration page. Adding a VoIP carrier : having opened an account with one or more VoIP carriers, you need to enter the account data (username, password, server proxy etc.) in the VoIP section of the Preferences function. If you want to use least cost routing functionalities you have to also enter the telephone rates applied by the carrier for the various prefixes. Definition of telephone rate plans : the last configuration step is to specify the call costs, based on the telephone number prefix, which your customers must pay to make their calls. For further information, refer to the Telephone Rate Plans page. Management of VoIP Call Shop : you can specify any VoIP carrier number, rate per second, step and percentage profit, routing of the call based on the prefix (cheapest carrier, specified carrier, default carrier and routing block) and the detailed statistics of calls made with relative profits. Complete management of customer data with the possibility of directly scanning documents. 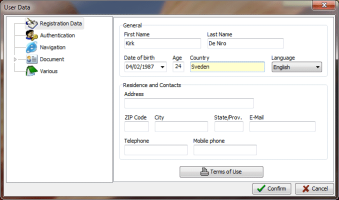 Optional expiry date for user accounts. Rate Plans : you can apply different rates based on the day, time or customer. Archive analysis : use of phone, recharges made by a customer, credit used, printing etc.. with exporting of results in Excel, in Html and in text format. Manual or automatic backup with the possibility of directly burning data on CD or DVD. Periodic compacting of programmable archives. Checkout management : opening and closure, automatic management of recharge and subscription renewal operations, manual operations and checkout analysis (balancing). 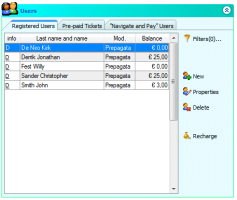 Management of operators with customizable permissions. Automatic application of software updates on all workstations. Setup wizard : guide to starting program configuration. Call Shop : the program allows you to set up a Call Shop with a minimum initial investment. Internet Cafè : very often Internet Cafés and Call Shops have common clientele. With Softvision Explorer you can manage both activities. Telephone rates are necessary to determine the cost to charge to the customer for a call made towards a prefixed number. In general, the costs of the calls that the carriers apply are different based on the country called. For this reason you will probably be interested in applying a rate that varies depending on the telephone prefix called. The telephone prefix code for the country or type of mobile phone. For example, 001 for the United States, 0039 for Italy, 340 for Vodafone etc. The name of the country that corresponds to the prefix. Default : the default VoIP carrier is used for the call. Cheapest : this mode enables call routing while always using the carrier with the lowest rate for that particular prefix. Obviously, to use this type of routing, the telephone rates of the VoIP carrier entered must be specified. Select carrier : in this case you can specify which carrier to use for calls with that particular prefix. Thanks to this mode, for example, you can decide calls to America must be made using the Cheapnet carrier, while those to Canada must be made using the Eutelia carrier etc. None : if routing is set at this value the call will not be forwarded to any carrier and therefore the customer cannot call the prefix in question. This function specifies the customer's master file data and the way he can use the workstation to navigate. Registration Data : The customer's registration data must be entered on this page. It is also possible to gather other data about his residence and possibly contact information (e-mail and telephone). Document : This section allows gathering all the information on an identity document: type, number, date and issuing agency. The two sides of the document can be scanned in the pages "Front Image" and "Back Image". Authentication : This section is used to specify the customer's username and password. Navigation/use : This page has options that control how the user can use phones. Note : In this last page, records can be added about the user. This section of the main window displays the names of customers in the archive together with their balance due and navigation method (prepaid, post-paid, traffic etc..). If the customer has a negative balance, the figures in the Balance Due column are red. This normally happens when customers are navigating in post-paid mode. Backing up the program archives is of vital importance for a variety of reasons. In fact, in the case of lost data due, for example, to a hard disk failure (an event that is hardly rare), all the users' data would be lost. This could lead to more or less serious problems: for example, should all customer receivable data be lost, you would not be able to provide session data to the courts, not to mention scanned documents, registry master file data, etc. This section displays all the calls made during the day. Various information is shown for each call : the customer who made the call, the telephone number called, the workstation and the cost of the call. 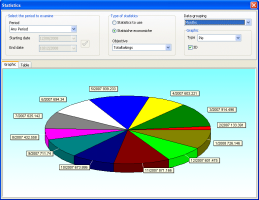 The Softvision Explorer archive contains a large quantity of data whose statistical analyses are a huge help in managing your business.